Hi,I have posted a number of questions relating to problems I am facing doing a wooden cabin top conversion. As I do not want to bore everyone, is there perhaps anyone out there whom I can communicate directly with about various aspects of cabin top support. 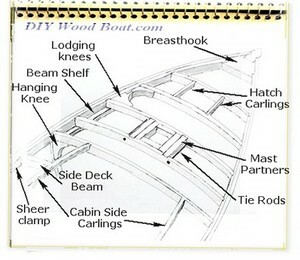 Post as many questions as you like, no wooden boat questions are boring to us wooden boat enthusiasts. One of the reasons the ‘Forums’ here are set out the way they are, rather than as a conventional forum is, hopefully, to make it easier to view previous questions and answers that might be of value to others. There are a number of problems regarding the stepping a mast on a cabin roof. This a quick sketch of the forces involved. 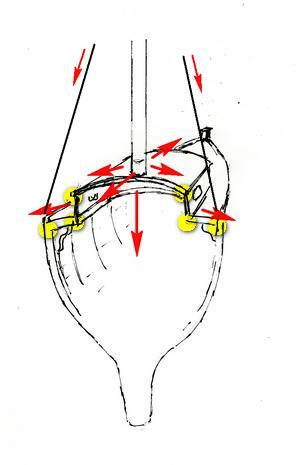 The main problem is how to transfer those forces through the beams, carlines and the joints between them. But much depends on how you want to arrange things, the size of your boat, the type of rig, etc. Mast partners and beams can easily be beefed up and held together with tie rods, and the mast supported vertically from the keel, the real problem is dealing with the lateral forces. So, do please tell us more about your boat.